If you want to make positive, future-oriented change in your organization you’ll need to go beyond writing long-winded paper visions and come to a shared agreement about what you are going to fight for together, and what steps you are going to take to get “there.” The 5 bold steps canvas is a perfect tool to align your teams in your organization. 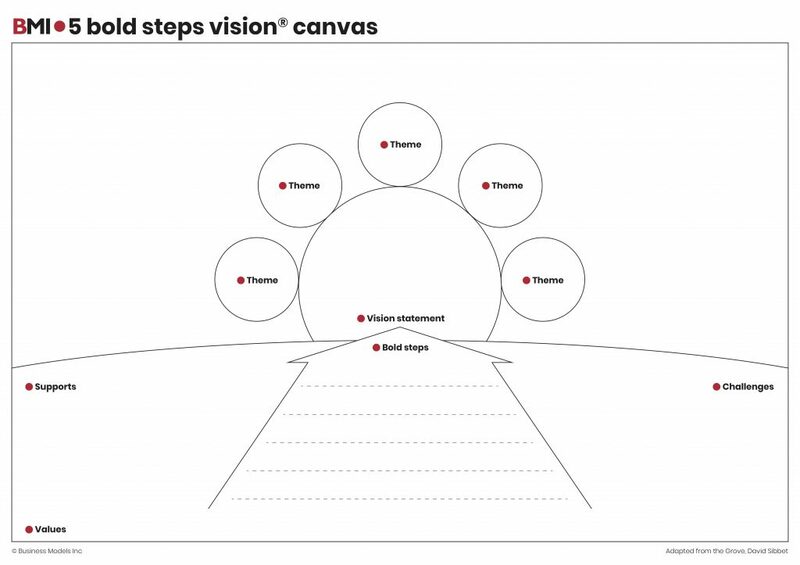 The 5 Bold steps vision® canvas was created by David Sibbet, of the Grove International. The vision canvas will help you co-design the vision as well as the 5 bold steps to achieve that vision. Additionally, using this tool, your team will be able to clarify what supports your vision, what challenges your vision, and what opportunities are created in working toward your vision. Best of all, the vision canvas will help you derive design criteria for your business model(s) and strategy. Probably the greatest aspect of the vision canvas is that your entire vision, including actions, supports, opportunities, and challenges, will be on one sheet of paper – not a book! It’s simple to share and easy to translate into concrete guidelines that decision makers (and executors) need to get their jobs done. Even better, creating a visualization of the vision, based on this canvas, will help you spread the word. Regardless of the approach, you choose to compose your vision, you’ll need to involve the right people. This includes the decision makers as well as everybody else! A vision without actions or ambassadors to carry the message forward is worth no more than the paper it’s printed on, no matter how well crafted. A high-quality, practical, and inspiring vision for any organization should have three key characteristics: it needs to state where the company wants to be in the near future (2–5 years); it must contain a level of inspiration and excitement (the rallying cry); and it must detail the bold steps by which to achieve the vision.